NASODREN nasal spray is a natural extract of fresh tubers of the plant Cyclamen europaeum L.
NASODREN is used for localised relief of the symptoms of nasal congestion (blocked up feeling in your nose), nasal secretions, loss of smell and facial pain by clearing and draining the mucous secretions retained in sinuses (passages leading to the nose), nasal cavities and upper respiratory tract, providing fast symptom relief from the very first dose. When you use NASODREN, you will experience an intense discharge of dammed up secretions from the nose and paranasal cavities, which can last up to two hours. As a result, the headache or facial pain, which often accompanies nasal congestion, rapidly ceases. • Acute or chronic recurrent inflammation of the paranasal sinuses (rhinosinusitis): catarrhal or purulent maxillary rhinosinusitis, frontitis, ethmoiditis, sphenoiditis, or combined rhinosinusitis. • Acute exudative or purulent otitis media, chronic exudative, acute secretory otitis media or purulent otitis media. • In postoperative care, after nasal or nasosinusal surgery. This medical device is available without prescription. However, you still need to use NASODREN carefully to get the best results from it. - Keep this instructions. You may need to read it again. - You must contact a doctor if your symptoms worsen after 5 days or do not improve after 10 days. - If any of the side effects gets serious, or if you notice any side effect not listed in this leaflet, please tell your doctor or pharmacist. • If you are allergic (hypersensitive) to Cyclamen, Primula and other Primulaceae, which could lead to swelling of the nasal mucosa, eyelids and/or face. • Apply only one spray per day into each nostril. • Avoid inhaling during application. • Avoid eye contact. Contact with the eyes may result in irritation and symptoms of acute conjunctivitis. • Take note of the section “If you are taking medicines”. • A brief sensation of mild and transient itchiness or burning, sneezing and shedding of tears or an increase in nasal secretions can occur a few minutes after administration. This is entirely normal and occurs when NASODREN begins to take effect and indicates an optimum reaction to this product’s effectiveness. Treatment should therefore not be interrupted. There may be a pinkish colored discharge from the nose; this should also be no cause to worry. Please tell your doctor or pharmacist if you are taking or have recently taken any other medicines, including medicines obtained without a prescription. Specially, if you are receiving treatment with anticoagulants (such as coumarin derivatives, acetylsalicylic acid) or anticholinergics (such as atropine). Other nasal products can be used 1.5-2 hours after using NASODREN. NASODREN is not affected by food and drink. Ask your doctor or pharmacist for advice before using NASODREN. There is no experience regarding the administration of NASODREN during pregnancy and breast-feeding. Therefore, NASODREN should not be used if you are pregnant or breast-feeding unless prescribed by your doctor. 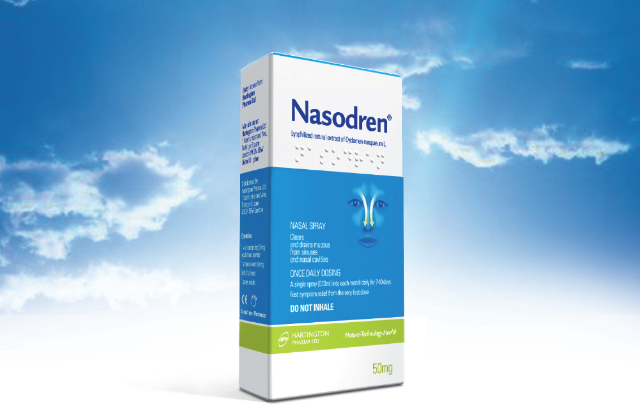 NASODREN can be used in children aged 5 years and above. Driving or using machines is not recommended for 2 hours after using the spray, because NASODREN is clearing and draining the mucus. NASODREN is for use in your nose only. Follow instructions and pictures below. 1. Open the vial containing the powder by turning the cap counter-clockwise and removing the stopper. 2. Open the plastic ampoule with the liquid by breaking off the upper part. 3. Pour the entire liquid into the vial with the powder. 4. Screw the spray nozzle onto the vial and shake gently until fully dissolved. Wait until no foam is visible. 5. Remove the protective cap from the spray nozzle. 6. Prior to the first administration, press the spray nozzle 2-3 times, aiming it away from the body into the air, avoiding the eyes! 7. Hold your head vertically, do not lean forwards or backwards. Insert the spray nozzle into the right nostril. Stop breathing for a short time (3-5 seconds) and spray the solution into the right nostril by pressing the spray nozzle once only. Breathe out deeply through the mouth once and then breathe normally. Do not inhale during administering the spray! 8. Then repeat into the left nostril; as described under 7 above. 9. Clean the spray nozzle with a clean paper tissue. Replace the protective cap on the spray nozzle. The solution should be sprayed daily only once into each nostril, preferably at the same time of day, approximately 2 hours before bedtime. Increasing the daily dose does not result in an increased effect. The treatment normally lasts 7-10 days but may be extended to 12-14 days if necessary. A significant improvement or total symptomatic relief is achieved after 6-8 applications; however, headaches often associated with the condition may reduce or stop completely after only 3-5 applications of NASODREN. Nevertheless, treatment should be continued for the recommended duration of 7-10 days. In cases that are complicated by purulent infection, you should contact a doctor. If a second course of treatment is necessary in severe or chronic cases, this should only be initiated 7-10 days after completion of the previous course. NASODREN overdosage can cause an intense burning in the nasopharyngeal space, without serious consequences. In case of an accidental overdose, irrigation of the nasal cavity through the nostrils with warm water and pharyngeal gargling with warm water can be useful. If you forget to take a dose, continue with treatment on the next day as recommended. Do not stop treatment sooner than stated in this leaflet because you may not obtain the expected results. Similarly, do not use NASODREN longer than stated here. Like all products, NASODREN can cause side effects, although not everybody gets them. Medical attention should be sought if prolonged shedding of tears or saliva lasting more than 2 hours occurs.. The original package must be protected from light and stored at a temperature lesser than 25°C. Once solution is prepared, NASODREN must be stored in a refrigerator at a temperature of 2-8°C protected from light. The expiry date is printed on the carton, the glass vial containing the powder and the purified water. Do not use after the printed expiry date. The expiry date refers to the last day of that month. Do not use for more than 14 days after preparation of the solution. This product should not be disposed of via wastewater or household waste. Ask your pharmacist how to dispose of products that are no longer required. These measures will help to protect the environment. - The active substance is: Lyophilized powder from a natural extract from fresh tubers of Cyclamen europaeum L.
Each dose of nasal spray releases 0.13 ml (2-3 drops) of solution. This quantity corresponds to 1.3 mg powder. The finished solution produces 38 doses to be applied for a maximum of 16 days. -There are neither artificial ingredients nor preservatives. A solvent (5 ml of purified water) is provided for reconstitution of the lyophilized powder. • 1vial containing 50 mg of lyophilized powder. • 1 ampoule containing 5 ml of solvent (purified water).